2.1 Earth is constantly changing as energy flows through the system. Geologic, fossil, and ice records provide evidence of significant changes throughout Earth's history. These changes are always associated with changes in the flow of energy through the Earth system. Both living and non- living processes have contributed to this change. 2.2 Sunlight, gravitational potential, decay of radioactive isotopes, and rotation of the Earth are the major sources of energy driving physical processes on Earth. Sunlight is a source external to Earth, while radioactive isotopes and gravitational potential, with the exception of tidal energy, are internal. Radioactive isotopes and gravity work together to produce geothermal energy beneath Earth's surface. Earth's rotation influences global flow of air and water. 2.3 Earth's weather and climate are mostly driven by energy from the Sun. For example, unequal warming of Earth's surface and atmosphere by the Sun drives convection within the atmosphere, producing winds, and influencing ocean currents. 2.4 Water plays a major role in the storage and transfer of energy in the Earth system. The major role water plays is a result of water's prevalence, high heat capacity, and the fact that phase changes of water occur regularly on Earth. The Sun provides the energy that drives the water cycle on Earth. 2.5 Movement of matter between reservoirs is driven by Earth's internal and external sources of energy. These movements are often accompanied by a change in the physical and chemical properties of the matter. Carbon, for example, occurs in carbonate rocks such as limestone, in the atmosphere as carbon dioxide gas, in water as dissolved carbon dioxide, and in all organisms as complex molecules that control the chemistry of life. Energy drives the flow of carbon between these different reservoirs. 2.7 The effects of changes in Earth's energy system are often not immediately apparent. Responses to changes in Earth's energy system, input versus output, are often only noticeable over the course of months, years, or even decades. 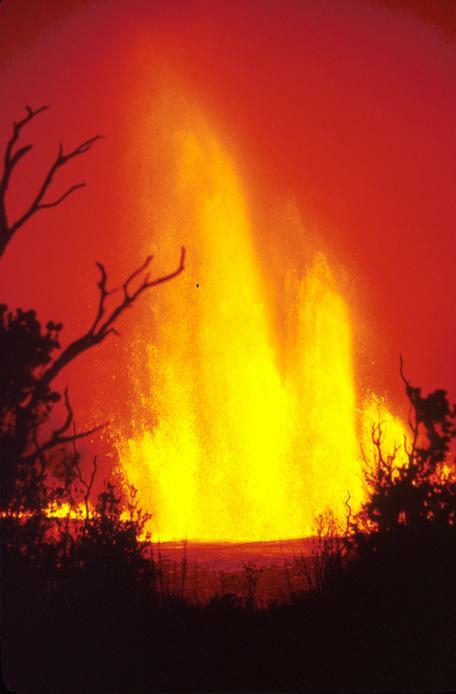 Volcanic fire fountains erupt at Mauna Ulu in 1969, showing a glimpse of Earth's internal heat. Image courtesy of US Geological Survey. Provenance: Image courtesy of US Geological Survey. When students learn about Earth processes, they generally focus on the process itself, such as plate tectonics, tides or stream flow. These ideas illustrate how all of Earth's processes are driven by energy. Energy transfer can be thought of as a the driving force of the Earth system. Most of the energy in the Earth system comes from just a few sources: solar energy, gravity, radioactive decay, and the rotation of the Earth. Solar energy drives many surface processes such as winds, currents, the hydrologic cycle, and the overall climate system. Gravity makes rivers and other materials flow downhill and creates tides (from the Moon's gravitational pull). Radioactive decay creates heat in the Earth's interior, while Earth's rotational forces influence currents of air and water. These ideas have considerable crossover with the Climate Literacy Principles 1 and 2. Climate Literacy Principle 1 focuses on the Sun as the primary source of energy for Earth's climate system, while Climate Literacy Principle 2 explains that greenhouse gases affect the energy balance of the Earth. Carbon dioxide and other greenhouse gases trap outgoing radiation that would otherwise exit the Earth system, thus warming the atmosphere. It also summarizes the carbon cycle through different carbon sinks and sources. 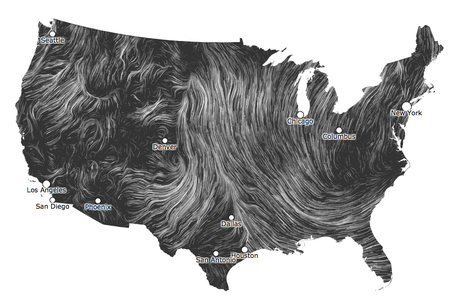 This map shows a snapshot of the patterns of wind flowing over the US. Energy flows on Earth can take many forms. In some cases the energy flows are constant, such as the decay of naturally-occurring radioactive materials within the Earth. This process releases heat to Earth's interior, which helps to drive the motion of plate tectonics at a fairly constant rate. In other cases the energy flows can vary over time, such as with the carbon cycle. Energy drives the flow of carbon between different reservoirs. Carbon can exist in carbonate rocks (like limestone), stored fossil fuels (like coal, oil, or natural gas) in the atmosphere, in the oceans, or in the molecules of biological organisms. Large scale burning of fossil fuels is removing stored organic carbon from the Earth's crust and releasing carbon dioxide into the atmosphere. This has changed the composition of the atmosphere so that it traps outgoing heat more effectively. Humans have therefore changed the natural energy balance of the Earth. Even without humans, the Earth has experienced changes in its energy balance. Over the course of geologic time there have been drastic changes in the flow of energy through the Earth. For example, the Earth was entirely molten early in its geologic history and was covered in ice during the PreCambrian period. The Sun was once 30% dimmer than it is today. Explore these ideas in the context of Teaching about the early Earth. These dramatic changes illustrate how changing energy flows through the Earth system have altered the course of Earth's history. Students can appreciate how the planet's energy balance has been affected by both natural and human influences. These concepts are subtle. It is far easier to grasp a familiar, observable physical process than it is to comprehend the energy that drives it. Start with processes where energy is readily observable, like volcanic eruptions or windstorms. From there, students can appreciate how energy is part of nearly every process on Earth. Have students use concept mapping to connect a process to the types of energy that are involved. Refer back to Energy Principle 1 for a list of different forms of energy. Alternatively, educators can employ a systems approach. Using the hydrosphere as one example, students can examine how energy is incorporated throughout the cycle. Solar energy causes evaporation; uneven heating of the Earth causes air masses to move; Coriolis forces help storms to take shape; and gravity makes rivers flow downhill. Another relevant factor is the high heat capacity (or specific heat) of water. This means that it takes a lot of energy to change the temperature of water. This moderating effect allows aquatic environments to stay at a relatively stable temperature compared to the air. It also explains why areas near large bodies of water have moderated temperatures with fewer temperature extremes than locations far from water. If teaching about climate change, consider how a warming atmosphere affects other processes such as storms, heat waves, and other forms of extreme weather. Due to the high heat capacity of water, the oceans can absorb most of the warming caused by climate change. But what other effects does this have? Another way to tie these ideas to the study of climate change is to look at albedo. This concept explores the way that the Sun's energy can be absorbed by Earth's surface or it can bounce off it and be reflected back into space. Snow and ice reflect the majority of incoming radiation. Darker surfaces like open ocean and bare land absorb more energy. As glaciers recede and sea ice melts, the loss of ice-covered area contributes to further warming. This is one example of a self-reinforcing feedback cycle. This principle can be embedded in lessons about Earth processes so that students gain familiarity with the idea that energy is an integral part of nearly all processes on Earth. Teaching the energy flow in systems is one way to encourage systems thinking in students. Because these ideas can be abstract, pedagogies that bring them to life are helpful. Visualizations and simulations can reveal hidden processes at work. Concept mapping can help students find connections between cause and effect. Students can even adopt a role playing strategy to become a carbon atom or a tropical storm. Once students become familiar with the idea that energy is inherent in Earth processes, these principles can be woven into many earth science topics. The Energy Flows activity introduces students to different forms of energy, energy transformations, energy storage, and the flow of energy through systems. Students learn that most energy can be traced back to nuclear fusion on the sun. Amazing Albedo is a lab in which students use thermometers, white and dark paper, and lamps to measure differences in albedo. Connections are made to albedo in Antarctica. Geothermal Energy: Harnessing the Power of the Earth - This short video explains how geothermal energy is tapped, converted to steam, transported to generators, and and converted to electricity. The Earth is a System visualization helps explain why understanding Earth as an integrated system of components and processes is essential to science education. The video Striking a Solar Balance uses colorful animations to illustrate Earth's energy balance. What Makes a Greenhouse Gas a Greenhouse Gas? and Why Do Some Molecules Absorb Energy? offer two interactive ways (computer simulation and hands-on model building) for students to learn how gases can trap heat. Wind and Ocean Circulation animation illustrates the trail of energy that flows from atmospheric wind currents to ocean currents. The high quality of the animation is engaging and would be very useful to explain complex processes that are hard to imagine. In the Hurricanes as Heat Engines activity, students examine the effects of hurricanes on sea surface temperature to explore how hurricanes extract heat energy from the ocean surface. Why Climate Change Makes Stronger Storms - This video reviews how increasing temperatures in the Arctic are affecting the path of the jet stream, the severity of storms, and the length of individual weather events. The activity Modeling Earth's Energy Balance uses the STELLA box modeling software to determine Earth's temperature based on incoming and outgoing radiation, albedo, and a complex atmosphere with latent and sensible heat fluxes. The animation of Greenhouse Gases - IR Spectra allows students to explore the infrared spectra of greenhouse gases and depict the absorption spectra. Vibrational modes and Earth's energy spectrum can also be overlaid.